While in the Hocking Hills area for the annual “Shoot The Hills” photography contest, several fellow photographers and I visited Saint John’s Evangelical Lutheran Cemetery, just outside Maxville, Ohio in Perry County. For its age, the gravestones and church are in amazingly good shape. Several of the residents in the area take care of the cemetery and keep the grass cut. 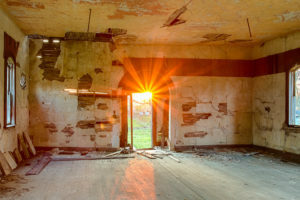 The photo above is from inside the remains of the church and was taken in the early evening around 7:30 PM. Given the bright light outside and the much darker interior of the church, the only way to achieve a balanced exposure was to take a series of 5 exposures, 1-stop apart and combine them in software to produce an HDR image. I used Nik Software’s HDR Efex Pro V2 to create the file and then converted it to black and white using Nik’s Silver Efex Pro 2 to get the image you see here. 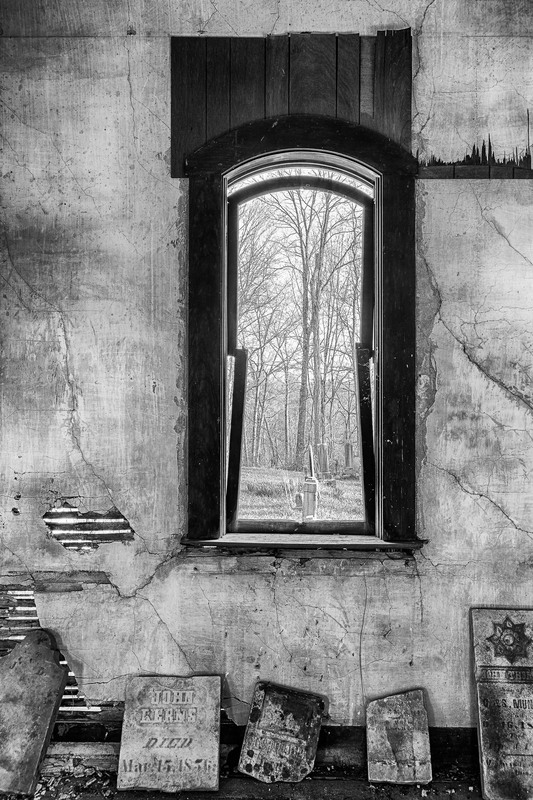 I really like this shot of the old gravestones lined up against the wall under the window. 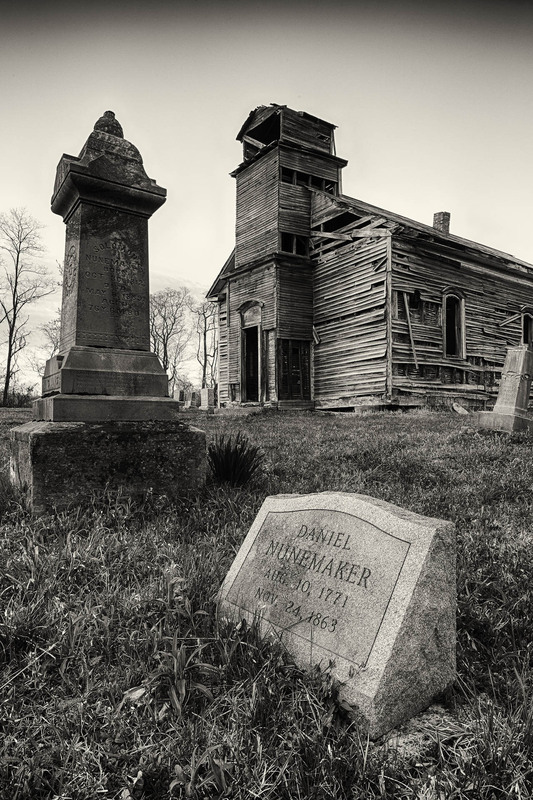 Pictured below is a low shot from outside the church that includes the gravestone of Daniel Nunemaker who lived to be a little over 92 years which was amazing given that he was born in 1771! 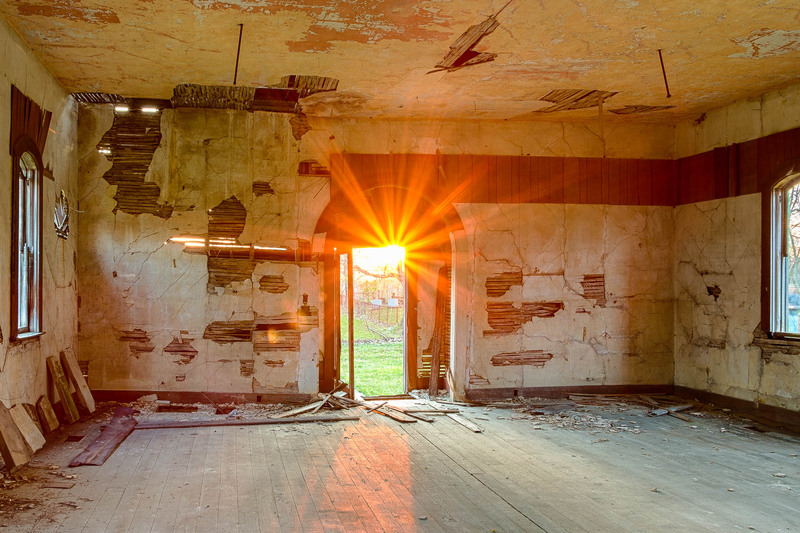 All the images in this post are from HDR files. While we were there photographing, one of the residents stopped by to talk to us and gave us a brief history of the church and cemetery. The St. John’s Evangelical Lutheran Church was started by Rev. Frankenburg July 14, 1841 in Monday Creek Township, Perry County, Ohio. Rev. Frankenburg had been preaching in private homes and barns for six year prior to starting the church. Jacob Goodlive, Wife Mary (Marie), son Henry and his wife Elizabeth were some of the very first members to sign the register. 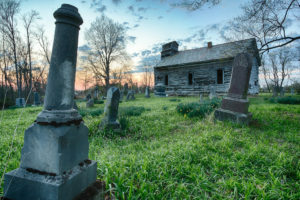 This entry was posted in General Photography, Photographic Technique and tagged Cemetery, Gravestones, Hocking Hills. I appreciate your photographs. I am relation to both the Goodlive and Nunamaker family. I have never personally been to the cemetery, but thanks to your photo I have been able to see a part of my family’s history. Thank you! Thanks so much for your comment and I’m glad you enjoyed my photo’s of the cemetery and church. One of the Goodlive’s who lives by the church stopped by while I was there and gave me a little history about the church.